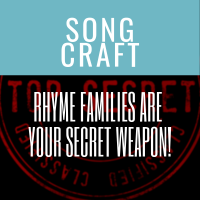 Using rhyme families effectively can help you not only move through a song, but add nuances to the rhythm, melody and feel or tone imparted. (That’s a favorite of my songwriting partner. She’s in charge of the music). Anyway – one of the best things I ever did was take a poetry writing class for forms. Forms are things like sonnets, terza rimas, villannelles, and all kinds of wondrous metered rhyme schemes. While the class was difficult (I write in free verse), it opened my eyes to how and why rhyme works within the language as a vehicle to help shape the meaning of a poem – or in our case – a song. And, because you’re forced to find both meter and rhyme that works for the poem, i.e., what it wants to be, and not for you as the writer, you often discover a whole new perspective on your original idea. Which is why writing of any kind is exciting! There are two types of rhymes: perfect rhyme and imperfect rhyme or family rhymes (aka rhyme families). Perfect rhymes are words whose: (1) syllable vowel sounds are the same, (2) consonant sounds after the vowels are the same if there are any, and (3) the sounds before the vowels are different. Example: snow, blow or dependent, evident. Imperfect rhymes, or a family rhymes / rhyme families, are words whose: (1) syllable vowel sounds are the same, (2) consonant sounds after the vowels belong to the same phonetic family, and (3) the sounds before the vowels are different. Example: snow, nose or break, cage. nasals, which resonate from the nasal cavity (m n ng). The easiest way to use the chart is to first look up a perfect rhyme in your rhyming dictionary, and then move to the sounds within the same family. So, if you have an end consonant of “b,” a voiced plosive, once you’ve tried “d” and “g” as an end consonant, move to the unvoiced plosives. The closer you stay to the family you started in, the better the rhyme will sound – i.e., not forced. A recommended rhyming dictionary is “The Complete Rhyming Dictionary,” edited by Clement Wood (and recommended by Jimmy Webb himself). You’ll get a great overview of meter/rhythm as well as an overview of the types of rhyme in the forward. Pat Pattison’s book “Songwriting: Essential Guide to Rhyming” is also a great source for a detailed study of rhyme. The book includes exercises around the sound chart and dives into devices like internal rhyme, alliteration and assonance. A “must have” on your bookshelf in my opinion. To hear close rhyme and clever rhyme schemes done well with strong lyrics/words, listen to any Brandy Clark song. She is THE MASTER of finding surprising but not overly contrived words to bring life and character to her songs. Mastering rhyme will open up how you approach a song, and lead you to a richer songwriting experience.